Some go to therapy, while others travel in order to escape their demons, but when the rigours of working as an RCMP officer — including salvage missions and body recoveries — overtook Clarence Creek resident Guy Boisjoli, he returned to his first love — watercraft and machinery from another era. If you head to the Rockland marina on a fine evening between late spring and Labour Day, you’ll find Boisjoli (the self-professed “Steam Guy” according to his licence plate) and Orion, the steamboat he assembled himself. If you’re interested in his boat and how it works, he’ll invite you on board for an unforgettable sunset cruise, travelling at about four kilometres per hour. Orion is named for one of the officers — Anthony Fitzgerald Orion Gordon — killed in the 2005 ambush in Mayerthorpe, Alberta. That tragedy unfolded the same year Boisjoli bought the hull. 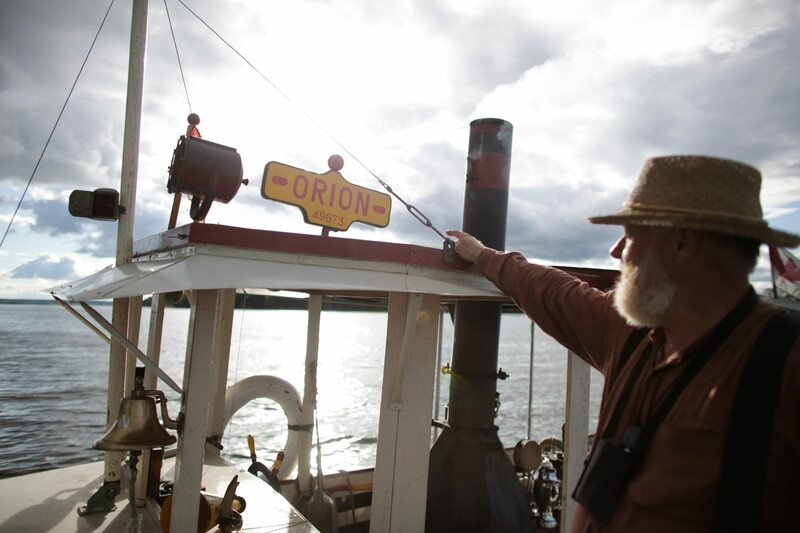 Calling Orion the ultimate steamboat, he says it runs on life’s two most basic elements: water and fire. A counter records the times the engine has turned over since the start of the season: 231,990 by late August 2015. He has rigged up a shower on board, using water from the lake, and a potty for his grandkids. 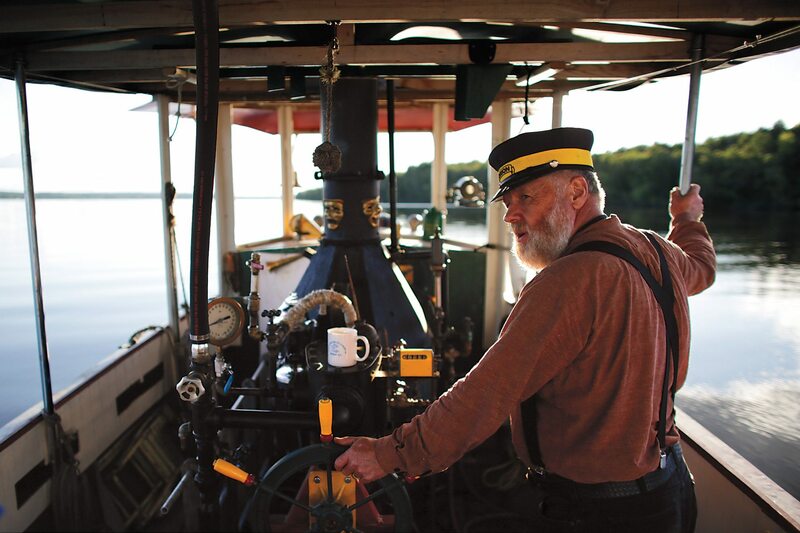 Clad in pants held up by suspenders, a linen shirt, and a sailors’ cap, Boisjoli, 65, plays the part of boat captain and chief tinkerer, though it’s also easy to imagine him as an RCMP officer. The boat is essential to his mental health, and he’s in it every evening the weather permits. “I once came out with my daughter on a three-day trip. For one of those days, I don’t think we said a single word. It’s all about this,” he says, suggesting that listening to the rhythmic humming and hissing of the engine and watching the boat’s reflection on the water are all he needs. There’s a rocking chair on board, as well as straw hats and wool blankets, which he offers to passengers in case they want to wear something period-worthy. Some props have no significance — “that fish came out of a garbage heap” — while others, such as the megaphone, which was turned into a 26-ounce flask and then back into a megaphone, were gifts from friends. A dynamite box was a garage sale find he refurbished; a sign saying Orion with Anthony Gordon’s badge number sits on the roof.